Ghost writers have always been figures of mystique. Often they are the unsung or at least, un-marketed heroes of wonderful literary works. This is especially true if these are nonfiction works and biographies. This is why a main character who’s a ghost writer is automatically an intriguing concept. After all, who doesn’t want to pull back the curtain and take a peek at Oz, the Great and Powerful? 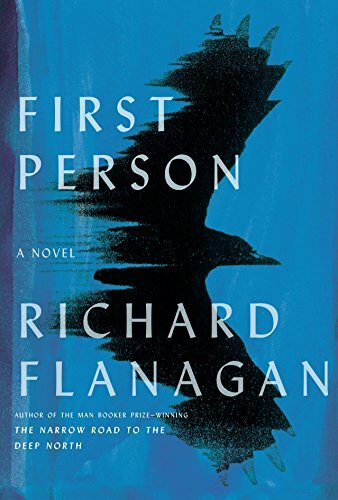 But is First Person, National Book Award Winner Richard Flannagan’s new novel, everything it promises to be? Or is it simply an ordinary man pulling levers? First Person tells the story of struggling writer, Kif Kehlman. Kif is working on his debut novel when he’s commissioned to write an autobiographical novel on Australia’s biggest conman, Siegfried “Ziggy” Heidl. The commission could be a lifeboat for Kif as he is more “struggling” than a “writer” at this point. But as with everything, there’s a catch; Kif has to finish the novel in six weeks, before Ziggy goes to prison. Kif eventually decides to take on the job, thinking he’ll be able to work fast and get it done in the allotted time. But there turns out to be a second catch; Ziggy has grown so accustomed to spinning stories and telling lies, is so tight lipped about his past and exploits that it proves all but impossible to get at enough facts to actually write the book. That is unless he wants the book to end up being about bizarre conspiracy theories and tall tales. These tales and theories are, of course, greatly entertaining for the reader. But the same can’t be said for the ghost writer who’s running out of time. In fact, Kif grows so anxious and irritated with the situation that he legitimately considers walking away from the project, along with the $10,000 fee. As the situation deteriorates for Kif, so does the hilarity of the situation. For eventually, Ziggy begins to grate on the readers’ nerves as well. What’s more, as the story unfolds it begins to take on a more and more ominous, vaguely threatening tone. Perhaps Kif describes it best when he says “Conmen are after your money . . . But Heidl was also after something more. Heidl was after your soul.” And Heidl truly does manage rip of pieces of Kif’s soul. As Kif becomes involved with Heidl, his marriage begins to unravel, along with his dreams of becoming a novelist. By the end of the whole ordeal Kif is not atop the world, pen in hand as he had envisioned but is reduced to a shallow TV personality. There’s an eerie similarity between the world that Ziggy creates by weaving lie upon lie and that which we live in today what with cries of “fake news” trying to weave an entirely different reality around us. So, too, there is a similarity between what this conman does and what a ghost writer does: create a fictional author and a world where that author is lauded. In some sense, it can be said that a good ghost writer is a conman in and of himself and is therefore veiled in the same air of mystery and mystique. The fact is everyone lives with the fictions he or she creates for himself or herself. A conman creates fictions for others to live in and thereby takes away what is theirs. In Kif’s case what Ziggy takes away isn’t just money but his marriage, his ambitions, will to live and idea of himself. In short, it is his soul, just as Kif said. As captivating as this situation is there appears to be an imbalance in tone that causes the reader to stutter as she’s reading. The earlier hilarity does give way to the tragedy of the situation. Yet the transition between the two seems halting, requiring the reader to push on with the story when the story itself should be pulling her in. That being said, the novel is still a dizzying work that keeps the reader on her toes. One never knows how things will turn out and where they’ll lead, and it’s easy to be taken with the intrigue of what’s fictitious and what’s not. In a world where many people would like to consider life as black and white, it is a relief to encounter a book that is unapologetically gray.